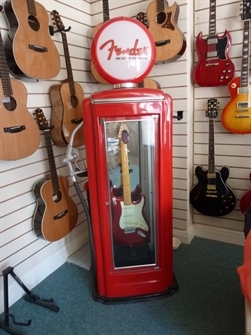 Beautiful Fender retro petrol pump dsplay cabinet, which can be used for one guitar or it has a series of glass shelves for multi items. It is fifnished in red poly plastic with aluminium pump handle and rubber hose. It also plugs in and lights up. Great price at 1750.00.